Over the years, the hobby has seen its share of Christmas cards (trading cards, not greeting cards -- although some have doubled as both) over the years. 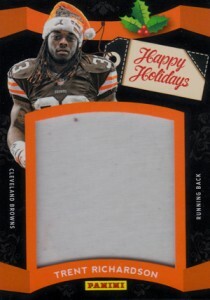 The list grows with the 2012 Panini Black Friday promo set. Randomly inserted in the special packs are special memorabilia cards featuring pieces of festive hats worn by top NFL rookies Andrew Luck, Robert Griffin III and Trent Richardson. The three top draft picks wore the special team-themed Christmas hats during a photo shoot at the 2012 NFL PLAYERS Rookie Premiere last spring. Each of the 2012 Panini Black Friday Happy Holidays cards has an image from the shoot on the front, a large hat swatch and a second photo on the back. Given the memorabilia source, the cards have a lot of texture. Because of the team patches on the hats, it also created several unique combinations. Similar Santa hat cards from the past have been included in Press Pass Racing sets and Upper Deck Christmas promos.